Let's start with a controversial question. What does a foetus have in common with a lab rat? The answer, of course, is that people are willing to resort to terrorist tactics to defend them both. In the US, I understand, a fringe of anti-abortion campaigners have long resorted to intimidation, violence, arson and even murder while here the UK it is animal rights extremists who are responsible for the death threats and vandalism. One irony is that the animal rights crowd, memorably called bunny-fascists by Minette Martin in the Sunday Times, have had a lot more success here than anti-abortionists have had in the US. Cambridge University has already scrapped plans for a new laboratory and Oxford looks set to go the same way. It won't surprise you to hear that I am against abortion in most circumstances and consider it is always an evil, only occasionally out weighed by a greater evil. I am also totally in favour of animal testing and value human life over any other living creature. I would wipe out the last damned tiger on the planet for the sake of a single human child. Now I appreciate that this is a view shared with many Christians, in part due to the statements in Genesis that man has dominion over the beasts and shares God's image. But you don't have to be religious to put humans on a pedestal (Minette Martin is an example) or to realize that the reductionist arguments employed by Peter Singer and Richard Dawkins against speciesism are pretty stupid. They claim that because we are just animals with DNA similar to other creatures, we are wrong to claim there is something fundamentally different about ourselves. I am aghast intelligent people can believe this as to reduce humanity to genetics ignores all but one of the things that makes us what we are. Besides, as no other animal cares about its rights and or anything elses', they contradict themselves when they claim that we should be the exception. The only possible reason we could care deeply about other species is that we are NOT like other species. I am also amused that Singer, as he states in an article in today's Guardian, finds people who believe in the foetus's right to life to be misguided. This is deeply weird. How on earth can he claim that a rat, or even a chimp, has a greater right to life than a foetus? The point of the article is to condemn animal rights extremists, but it really shows just how confused his thinking is. His reason for condemning them is not just that they are evil (which they are) but that they make it harder to condemn anti-abortion extremists! Finally, let me explain why a non-theist should also find the idea that all animals have equal rights is bogus. Non-reductionists do not define our humanity as a ghost in the machine (whatever the late Francis Crick thought) but by our place in a web of language and culture. No man is an island, as John Donne taught us, and this was given philosophical teeth by Ludwig Wittgenstein who demonstrated that we are defined by our part in a network of communication. Any efforts to position ourselves outside that network lead to absurdities. We should also note that other animals form no part of the matrix of humanity and hence we are justified as excluding them as agents in ethical discussions. We have duties towards other species, but these are a function of our humanity and nothing to do with the animals. Singer's and Dawkin's efforts to invent a new "-ism" of discriminating against other animals is philosophically wrongheaded. I can only assume that neither of them have much idea about what it means to be human, and reading their works only re-enforces that point. There is a big fat book from the British Academy that lists all the medeival and renaissance library catalogues still extant. They have got through ten volumes now and at least five more are in the pipeline. The latest volume to come out has been the one on the Colleges of Cambridge University (I impatiently await the Oxford edition) which I hav found very useful for my research. The point of all this is that it allows us to see just how completely random the survival of books and manuscripts is, as well as how it is usually bad luck or neglect that causes us to loose them. For instance, not one of the large collection from Clare College's medieval library survives because the fellows made off with the books when they thought the college was about to be closed in 1549. This was after the library had survived a terrible fire in 1521. Likewise, nothing remains of Queens' College's ancient library. On the other hand, Pembroke College and Peterhouse still hold up to half the books found in their catalogues dating from the Middle Ages. It used to be thought that there was some sort of systematic library clearance by the Protestant reformers (and their may have been in a few cases at Oxford) but in reality the losses are due to carelessness, theft and throwing out stuff that was not considered useful anymore. Very many medieval manuscripts were binned as soon as a printed version of the same book was available. This explains why we have so little left from the ancient past. If Pembroke College can loose half its manuscripts in a few hundred years when it has a library that was never ransacked or suffered large scale damage, what hope was there for the libraries of Alexandria and Rome when both cites have been sacked, razed and taken by endless invaders and rioters. And last year, in Baghdad, as my correspondent below notes, the national library went up in smoke. This was not due to any deliberate policy but just due to the break down in law and order which accompanied the occupation. The lesson of the losses at Cambridge from a secure and academic environment without the risks of war, is that we don't need to ask how libraries are lost. The more interesting question is how on earth anything has survived for as long as it has. All this controversy about Dan Brown's airport novel, "The DaVinci Code" had been rather passing me by. But now I've meet several people keen to discuss it - and this is in the UK where it took off rather later than in the US. Part of the reason people bring it up is that they are interested in my opinion as a historian specialising in science and religion. They have tended to be disappointed by my utter disregard for the alleged historical background, more impressed that I can reel of Brown's sources and are usually willing to admit they should have realised the book is wholly fiction rather than fiction based on fact. Note, I see nothing wrong with Brown dressing his novel up as base don fact - Umberto Eco did it brilliantly in The Name of the Rose. As an aside, the Holy Blood and Holy Grail is one of the conspiracy theories satirised by Eco in Foucault's Pendulum, so that tells you what he thinks of it. One irony is that The DaVinci Code proves there is nothing new under the sun. The original Priory of Zion hoax dates back thirty years, the Holy Blood and Holy Grail came out in the late seventies and there has been a constant flow of pseudo-history ever since. But the timing is unfortunate for radical atheists. Their conspiracy of choice is that Jesus never existed, not that he retired to the South of France with his wife and kids. As both depend on the same Church covering up two entirely incompatible events, the head of steam the Jesus Myth has been gaining through the internet might well go to waste. At least everyone can agree that the Vatican has been covering something up, even if no one can decide exactly what it is. Another nail in the pagan copy cat thesis popularised by Freke and Gandy. The idea, originally based on the work of James Frazer, that there is such a type as the 'dying and rising God' is apparently quite wrong. This thread at ebla gives the low down on some modern scholarship that demolishes Fraser's claims. Been away at a lovely country retreat, without an internet link, so I can write some stuff for my thesis without distractions. It worked rather well and I am tempted to try the same thing again sometime. Sadly it meant my email box started to overflow to apologies for delays in replies. There are plenty of efforts to assemble lists of texts available on line in different areas. A useful project might be to produce a list of all the translations of ancient, medieval and renaissance scientific texts easily obtained in modern additions. The list would be maintained on line but certainly should not restrict itself to texts only found on the web. I mention this because I have been pleasantly surprised at how much can be found in English of Archimedes, Boethius, Sacrobosco and other lesser known figures. As any understanding of early science requires the sources to be available, it can't be a bad thing to have a handy list for those whose Greek and Latin isn't what it might be (and while I'm happy with my Latin, my Greek is non-existant). No doubt, I should also be the one to do it, unless any readers know of it having been done already. We have a challenger. My debate proposal on the Sec Web has been accepted. Actually, it was accepted a while back but the Private Message system broke down and I had stopped checking the thread. I'll note developments here but hopefully we can start off fairly soon. I have something of a weakness for internet discussion boards and have even considered adding one to Bede's Library. However, I've contented myself with adding a 'Comments' function to this journal so that readers with something on their minds get let us all know. For real discussion and argument I strongly recommend popping into the Ebla Forums run by Hugo Holbling and Celsus. Both these gentlemen are well worth talking to in their own right (Hugo is an expert on the philosophy of science and Celsus on the Old Testament) but their boards are gradually becoming the best place for intelligent conversation on the web. Ebla is non-denominational and, although the admins are not Christian, they allow none of the knee jerk anti-religious sentiment found at the Sec Web. I should point out that I help moderate two of the Ebla forums but relatively little is required as the tone is usually respectful of other points of view. So, if you are interested in talking about the sort of thing that I write about in Bede's Library, give it a go. We were treated to a very pleasant lunch today and afterwards discussed Barbara Theiring's work with our host. Naturally, I was quite dismissive but thought it worth checking out some web resources to get the latest thinking. The most important new developments in the world of the Dead Sea Scrolls are that they are now firmly redated. Previously they were widely thought to have been deposited about 68AD when the Romans overran the Qumran settlement where the scrolls were discovered. Now, as this article on Redating to the Scrolls shows, the pottery they were placed in dates to the first century BC. That is about 100 years earlier. This date is confirmed by palaeogrpahy and existing carbon dating of scroll scraps to the same period. The new dating makes any connection with Jesus, who lived from about 5BC to 30AD, completely impossible as the scrolls had been buried long before he or his followers were born. This means that theories like Theiring's, and more notably Robert Eisenman's "James, the Brother of Jesus", that link the Dead Sea Scrolls to early Christianity have been proved wrong. They were not exactly cutting much ice in the scholarly community anyway, but now they are dead and buried. It will be interesting to see if we hear any kind of retraction from these authors as a result of the new dating. As well as the historical Jesus, another biblically related subject creating a lot of hot air an some interesting stuff is Archaeology in the Middle East. This used to be called Biblical Archaeology but now everyone agrees that for the purposes of scholarship, that is a misleading title. Few modern archaeologists are out to prove the bible. The controversy is largely around the so-called minimalist/maximalist debate. This seems to be between those who thing their is some contemporary history to be cleaned from the Books of Samuel and Kings, and those who say the whole Bible was written after the exile to Babylon just a few centuries before Christ. What I hadn't realised is that the debate is really between archaeologists who have a good feel for how to interpret their findings, and literary critics from two universities who seem to know little about either archaeology or history. This article, Three Debates about the Bible and Archaeology, is a must read for anyone even slightly curious or worried about some of the wilder claims about how no one in the Old Testament actually existed. Once again, it seems a few academics with good publicists are making the running - just like the Jesus Seminar. 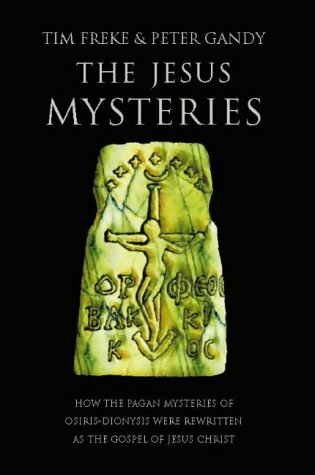 The authors, Peter Freke and Timothy Gandy, present this as evidence that Jesus was derived from the mystery religions. We can reject that, but the question remains, what is this amulet and why does it show a pagan god on a Christian symbol? "In his review of this book [Orpheus and Greek Religion] in Gnomon (1935, p 476), [Otto] Kern [unfeasibly esteemed German expert on Orpheus] recants and expresses himself convinced by the expert opinion of Reil and Zahn [more distinguished Germans] that the gem is a forgery." Firstly, please could the Greek gentlemen who sent me a feedback about Scythopolis email me again? I can't reply at present as I don't have an email address. I've been in a bit of an argument about The Jesus Mysteries by Freke and Gandy, specifically regarding my review of the book here. Now, I have to admit that I am very rude about it because I think it is unadulterated rubbish and that the authors are not honest about the way they set to work. That said, the heading and some other editorial content are by the webmaster, JP Holding, who is even ruder than me! Defences of The Jesus Mysteries fall into three categories. There are those who claim they are right, at least in part. To be fair, these people usually admit they didn't know enough to make a judgement once they have seen some of the howlers in the book. They then admit the book contains many mistakes and join the second category. These people say that the book is only intended as a popular work and it is unfair to expect it to expect scholarly rigour from it. Quite why this means sloppiness and dishonesty are suddenly allowed, I have no idea. The people who are in this category might be the first to rip a part popularist Christian books for not being au fait with all the latest critical scholarship, but are much more forgiving of Freke and Gandy. As far as academics are concerned, the 'duty of care' owed to the reader when writing a popular book is actually much greater than writing one for scholars. Fellow professionals might spot when you have assumed too much or slipped in a dodgy axiom. The general public have no chance. Besides, The Jesus Mysteries contains hundreds of endnotes and certainly appears to be pretending to have some of the scholarly rigour it actually lacks. Finally, there is the sort of person who prides herself on being open minded says that The Jesus Mysteries is 'interesting' and other points of view should be treated with respect. When these people start to be respectful of creationism and conservative Christianity (which I respectfully disagree with in many ways) I will start to be open minded about the Jesus Mysteries.